The official poster of The Informer has been released along with the news of a new release date. Originally set for a March 2019 release, the film was pushed back to August 16th. Check out the poster and one additional still in our gallery! MOVIEWEB – The Informer has received a new poster and release date. Instead of opening in theaters at the end of next month, the movie with now be released on August 16th. Aviron Pictures did not reveal the reasoning behind the decision. 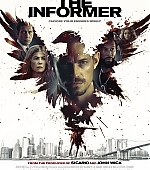 The Informer is based on the novel Three Seconds by Borge Hellstrom and Anders Roslund and focuses on honorably discharged Special Ops soldier Pete Koslow (Joel Kinnaman) as his world is turned upside-down when he is jailed after a fight to protect his wife (Ana de Armas). He’s given a chance for early release by becoming an informant for the FBI (Rosamund Pike and Clive Owen) and using his covert skills in an operation to take down The General, the most powerful crime boss in New York. But when the FBI sting meant to finally earn Koslow his freedom results in the death of an undercover NYPD cop, Koslow finds himself caught in the crossfire between the mob and the FBI. Caught in a world of impossible choices, Pete Koslow knows he must return to prison, where he then formulates a plan to escape the clutches of three of New York City’s most powerful organizations, the mob, the NYPD and the FBI, in order to save himself and his family.